Yum Veggie Burger: Yet another burger joint in Astoria? Yet another burger joint in Astoria? Last weekend I snapped this photo as I walked past the under-construction facade of the new "Burger Club" restaurant on the corner of 30th Ave and 32nd street. Although they already have their website URL printed on the awning of the building, the site itself doesn't offer any information aside from "COMING SOON". Seems like my neighborhood is in the midst of a gold rush of burger joints right now. Will this latest edition be any good? Will it be able to stand up against Bare Burger's two locations? 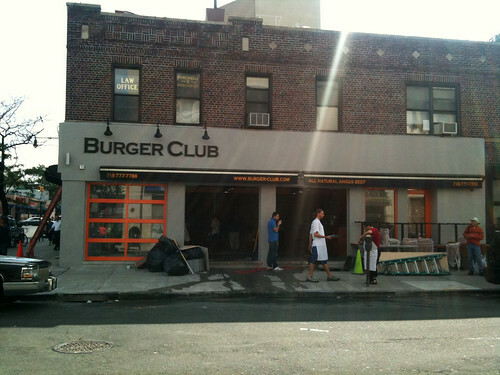 Most importantly, will Burger Club offer a veggie burger on their menu? The anticipation! I keep forgetting to tell you that my parents caught a segment on Fox News (don't ask; they're democrats & I can't figure it out either) with a chick reviewing NY veggie burgers a la "Yum". So, was it you or is someone biting? Weird! That wasn't me... now I'm very curious though! Let me know if you hear anything more about it!